This is a lovely side dish. You taste the smokiness from the roasting process, the sweet acidity from the Balsamic, and the earthy saltiness from the parmesan cheese. It’s quite a flavor combination. I always get amazed at people on the internet. I found this recipe on Pinterest and it looked intriguing so I thought I would try it. I found the recipe on Kalyn’s Kitchen’s blog here. The recipe is dated January 14, 2009. Since then I have googled this recipe and found countless versions of the SAME recipe, each one stating it was his or her recipe. for instance, in Tastebook.com there is the same recipe submitted at some unspecified date by Kelsey Powell with the identical photo. A Taste of Olive, a commercial enterprise, also lists the recipe without any credit to whomever created it. Stirring Up Memories Cookbooks also lists this recipe as their’s, too. Now granted this is not an overly complex recipe and uses very popular ingredients; therefore, more than one person could conceivably have created this recipe but it does make you wonder. The internet is a wonderful place where you can meet wonderful people. Unfortunately, there are some not so wonderful people out in cyberspace, as well. They prey on the unknowing and unwitting. They steal copyrighted materials and profit from their ill deeds. It just drives me nuts. Perhaps it’s just the lawyer in me but I have problems passing off other’s works and ideas as my own. Given the earliest dated post I can find is Kalyn’s Kitchen (and I got this from her website), I credit this recipe to her. We tried it, liked it and I encourage you to try it, too. Just make sure you give credit where credit is due. 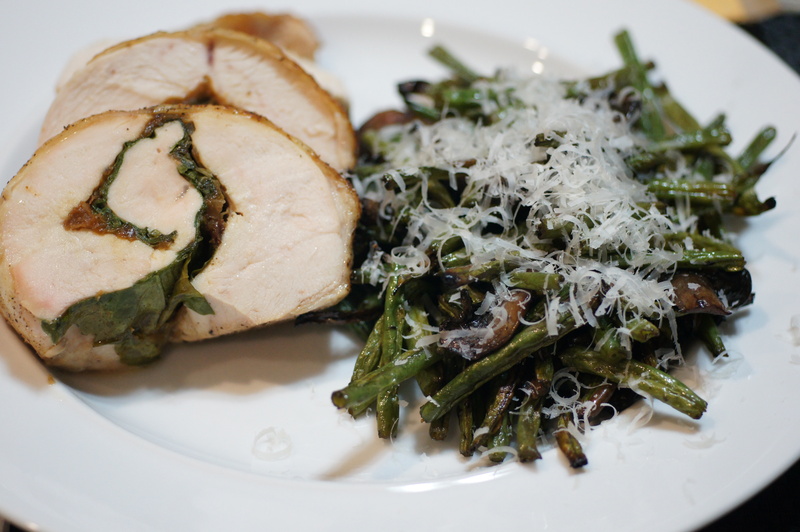 Thanks to Katlyn’s Kitchen for steering me to a new way to dress green beans. Preheat oven to 450F. While Kalyn states to wash the mushrooms, don’t as they get waterlogged. Clean them with a DRY paper towel and cut them into 1/2 inch slices. Trim ends of haricot vert and cut them in half so you have bite-sized pieces. 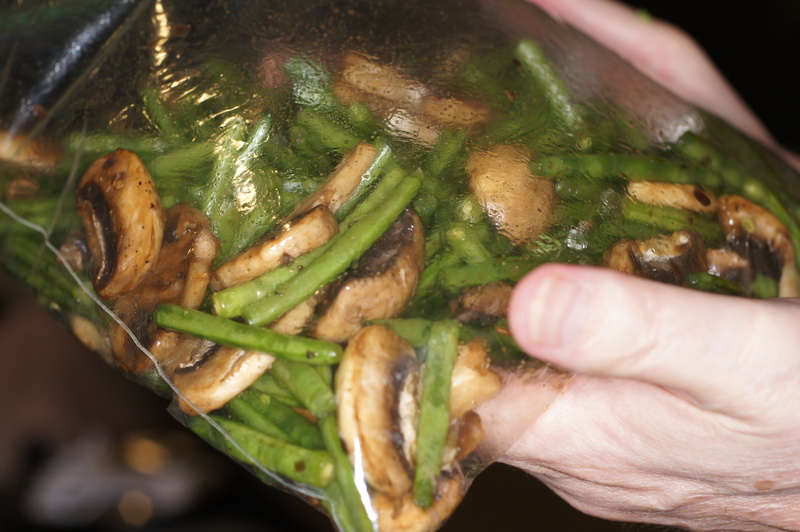 Put cut haricot vert and mushrooms into a Ziploc bag. 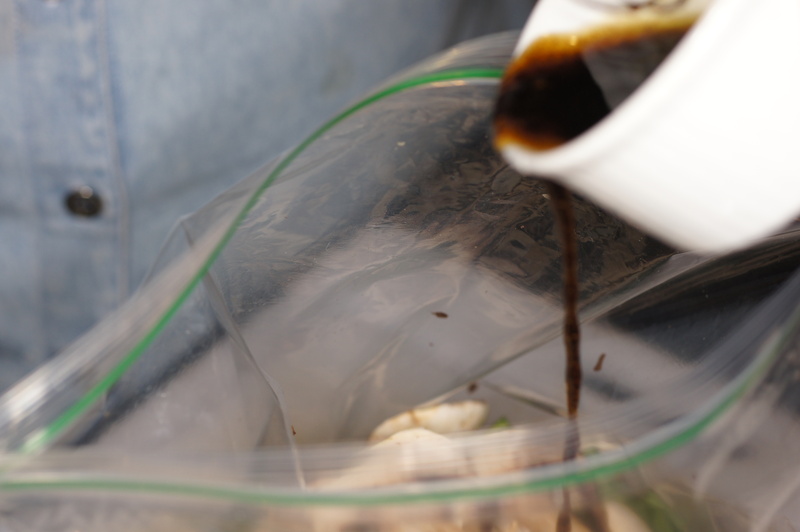 Whisk together olive oil and balsamic vinegar and pour over. Although Kalyn suggests you then squeeze bag or stir so all the beans and mushrooms are lightly coated with the mixture, don’t bother. Simply seal the bag with air in it and shake. This will coat the beans and mushrooms without bruising them by massaging the veggies to coat them. 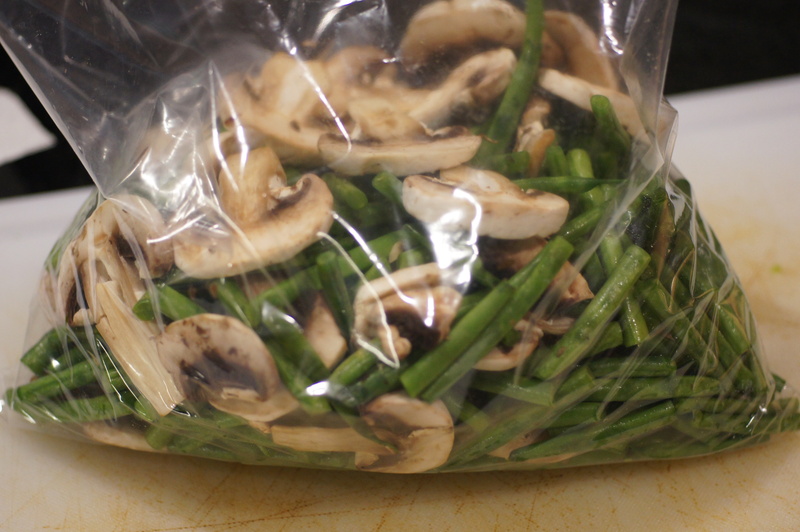 Arrange on large cookie sheet, spreading them out well so beans and mushrooms are not crowded. although Kalyn states roast the beans and mushrooms for 20-30 minutes at 450 F, DON”T DO THIS! 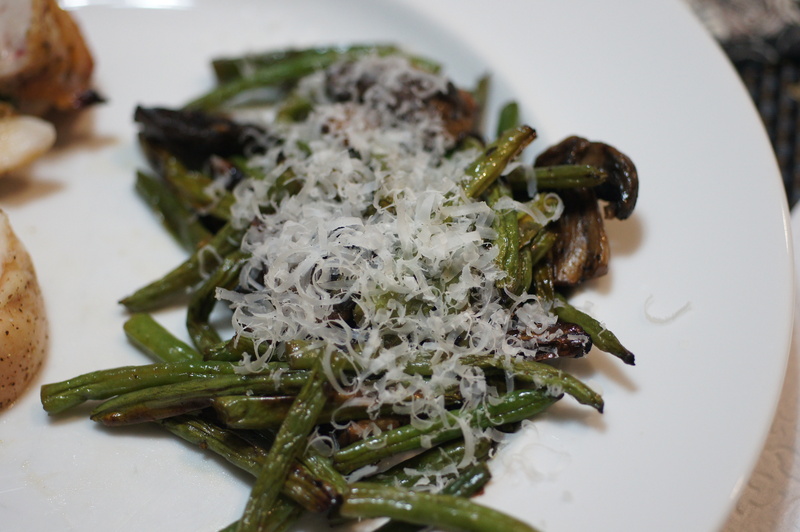 It’s an absolute disaster unless you want leathery, chewy haricot vert and mushrooms. Kalyn overloaded her pan so the extra time was needed. IF you lay the beans out in a single layer on the cookie pan (use 2 if needed) you only need 12 – 15 minutes tops to complete the dish. 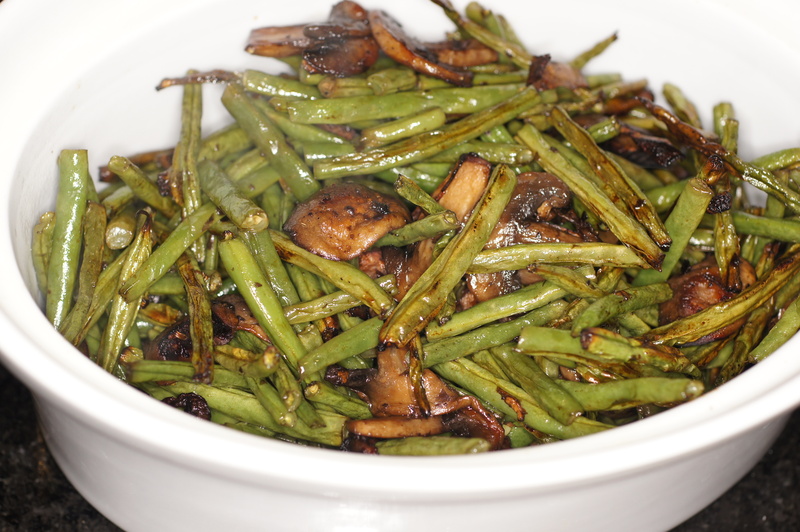 Cook until beans are tender-crisp, mushrooms are cooked, and all liquid on the pan from mushrooms has evaporated. Remove from pan and adjust seasoning. Serve and top with parmesan cheese to taste. Enjoy! You know, I came across the same thing with one person snagging another’s recipe. I was looking for a gluten free chocolate cake recipe and I found one that seemed pretty easy. I did more searching and when I went to the Hershey’s website, there it was, the exact same measurements and instructions, and the only thing they swapped out was spelt flour for regular flour! NOT cool at all! I often refer to other recipes from cookbooks or websites and always mention the source as well as any modifications. I only have a few recipes that I can truly call my own, and even so, those recipes are undoubtedly influenced by others that we enjoy. Having said that, this recipe sounds delicious, and thanks for all the extra tips, they always come in handy! It happens. For instance, let’s take Mille Crepes, a decadent cake of layered crepes (20) and cream. Many people think Mille Crepes was created by Lady M in NYC but truth be told the basic recipe and technique had been around long before. A similar version, layered with whipped cream and jam, called gâteau de crepes, appears in the Larousse Gastronomique. As the book explains, filled layers of crepes is an age-old recipe. Very few recipes are unique to anyone but if you “borrow” someone else’s recipe for your own self publication, at least give credit to those who steered you in the right direction. I have to agree about people claiming recipes as their own…it is terrible. It takes me a lot of time to create my recipes and make sure all the measurements and instructions are correct. I’m flattered when someone makes one, even posts about it…but always give credit where credit is due. I can’t wait to try this recipe. I roast lots of vegetables but haven’t done green beans. Thanks for all the tips. Thanks for dropping by and your comments. It’s always good to see you. Thank you Richard, I feel the same when you stop by. I hope you had a wonderful time in St. Croix. I used to have a business in St. Thomas and know how beautiful the islands are. This sounds delicious! Def giving it a try.